Features: Bending degree is 180. You can adjust the angle of lighting, making this area brighter. Application: Used for photography, illuminating homes, offices, workplaces, etc. Material: made of flame retardant PBT, heat-resistant up to 160 °C, erosion resistant and durable. Extend bulb base by 3.9 inch. Ideal extender to lower your bulbs further in recessed fixture, spread the light more evenly throughout your room. 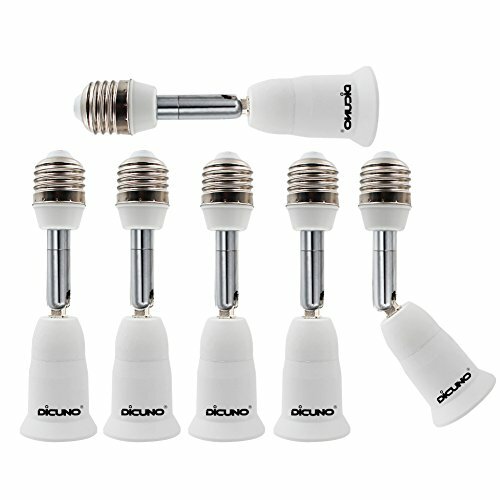 Wattage range: 0~ 60W. Perfect work for all voltages, and best for LED /CFL bulbs with wide base. E26, E27 socket extender. Bending degree is 180. Ideal extender to adjust the view angle of camera Nu-cam light bulb, Spotlight Aurora Singled Motion Sensor Light Bulb and so on. Use this flexible extension to see any angle within 180°you want,making this area brighter. Material: made of flame retardant PBT, heat-resistant up to 160 °C, erosion resistant and durable. CE certificated. Application: Used for photography, illuminating homes, offices, workplaces, etc. Wattage range: 0~ 60W. Perfect work for all voltages. Warranty: 3-month refund service and 1 year warranty service. If you have any questions about this product by DiCUNO, contact us by completing and submitting the form below. If you are looking for a specif part number, please include it with your message.